Appellants Sinead Fitzpatrick, who lives close to the location where the centre was to be developed at Derrydonnell Woods , and Allan Daly of Athenry took the legal action after Apple got planning permission from the board in 2016. Their appeal centred on the extent to which An Bord Pleanala was obliged to assess the environmental impact of the entire Apple plan for eight data halls rather than just the first phase which received the permission. Even though Apple withdrew from the project in May of last year following years of delays, the Supreme Court agreed to hear the appeal because the issues could affect future planning of other data centre developments. Today the five judge Supreme Court unanimously ruled An Bord Pleanala was not obliged to carry out a full EIA on the entire masterplan. The court also said the it did not consider it necessary to refer the issues for ruling by the European Court of Justice. Each side is to pay their own costs, the court decided. 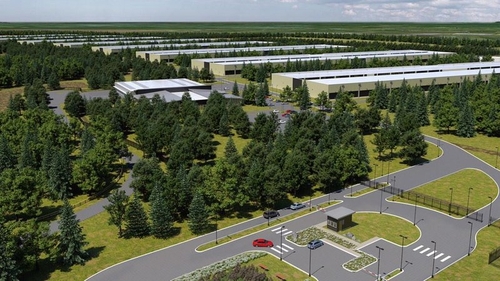 Apple first announced plans to construct the data centre on the greenfield site in February 2015. In October 2017, the High Court cleared the way for the project to proceed and the following month, the court refused to give the objectors permission to appeal its decision to the Court of Appeal. But the following December, Mr Daly and Ms Fitzpatrick then asked the Supreme Court to hear an appeal of the High Court decision and in May the court granted their request. The body responsible for attracting foreign investment to Ireland has welcome the decision of the Supreme Court. However, speaking on RTÉ's News at One, IDA Chief Executive Martin Shanahan said the company has made it clear they do not plan to proceed with the Athenry project. He said Apple first announced the investment in 2015 and it has taken until April 2019 to get to the end of the planning process. Mr Shanahan said this points to the need for more certainty around the planning process, particularly when it comes to the timeline. "We have a lot of large infrastructure projects that have proceeded without any impediment. They go through the planning process and I think we and our clients respect the planning process, we respect the fact that there are checks and balances in place. "It is certainty around the process and timing rather than certainty around outcome that people are looking for." He added that Ireland competes for foreign direct investment with other countries who are capable of completing the planning process "at speed".